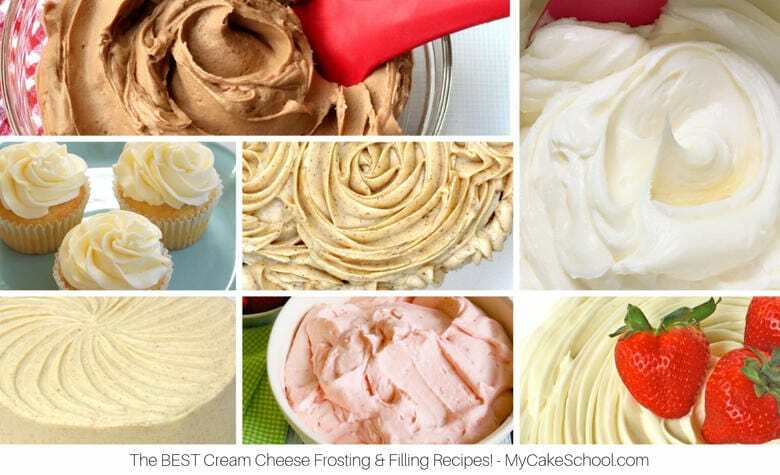 Oh how I love this Cream Cheese Buttercream Frosting Recipe! As far as I’m concerned, it is one of the most addictive frostings out there, I just can’t resist that silky smooth deliciousness! 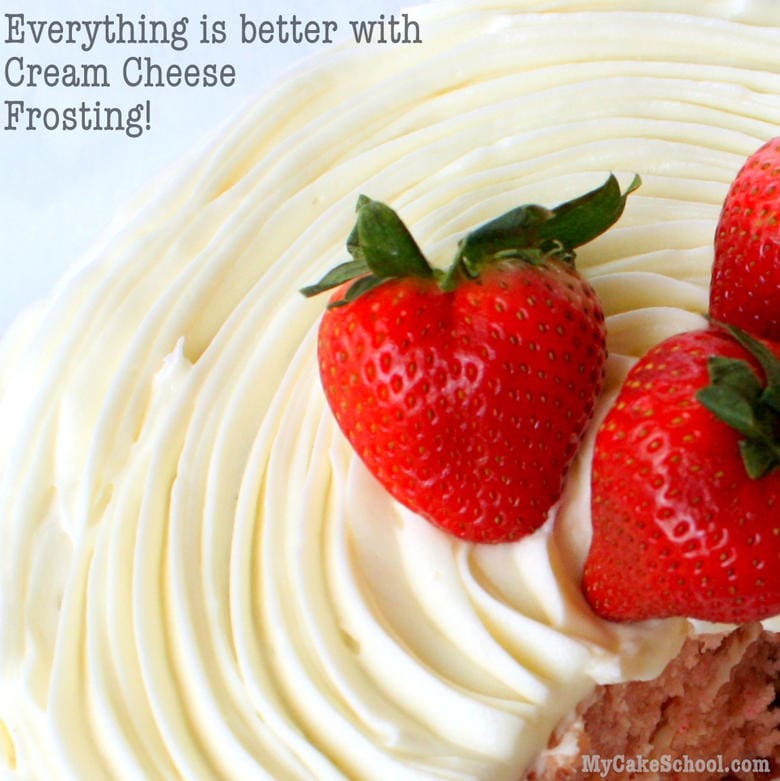 The best part about cream cheese frosting is that it perfectly complements SO many different types of cake. I can’t imagine having a slice of Red Velvet, Carrot, or Spice Cake without a generous slathering of cream cheese frosting! Oh so good! We also love cream cheese frosting with strawberry cake, lemon cake, chocolate cake, and well….any cake really! It’s such a quick and easy recipe, and over the years we’ve made a variety of delicious flavored cream cheese frostings as well. For instance, some of our favorite flavored versions are Lemon Cream Cheese Frosting, Cherry Cream Cheese Frosting, Orange, and more! But sometimes it’s best to just go with the classic Cream Cheese Buttercream. Mmmmm. We’ve been swirling & filling our cupcakes and cakes with this frosting for years but as is often the case with Cream Cheese Frosting, it is a bit on the soft side. If you need a thicker consistency, you can add additional powdered sugar in small amounts until you reach the desired consistency. If your Cream Cheese Buttercream becomes increasingly soft as you pipe, to the point that it no longer holds it’s shape, just pop it in the refrigerator for a minute. This could be caused by a super warm kitchen, or warm hands against the piping bag. Either way, a few minutes in the fridge will work wonders. (Just not too long or it’ll become too firm!) Oh the joys of cake decorating! If you plan to do a lot of piping, you can find a link to another favorite Cream Cheese Frosting recipe towards the bottom of this post, which is a bit firmer due to a higher proportion of cream cheese in the recipe. This classic Cream Cheese Buttercream Frosting tastes amazing! It is silky smooth, super flavorful, and tastes perfect with red velvet cakes, spice cakes, chocolate cakes, and more! 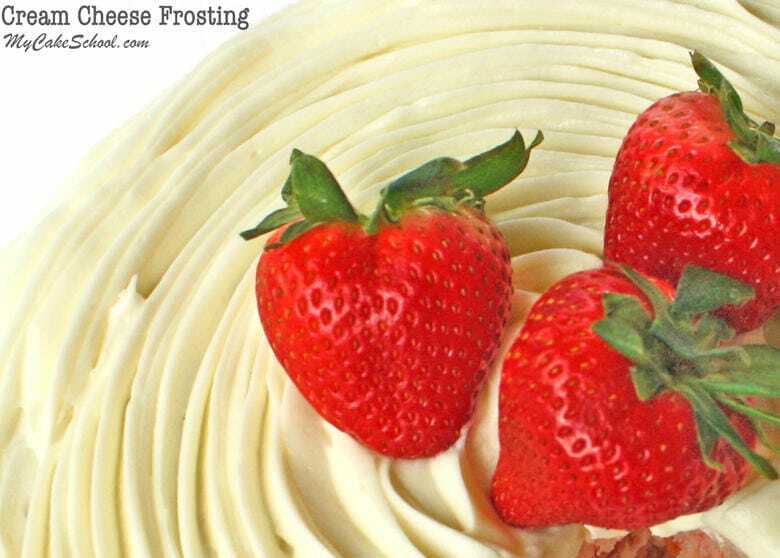 Did you know that we have another Cream Cheese Frosting Recipe? You may also like this Pipeable Cream Cheese Frosting, which contains even more cream cheese and therefore is a bit firmer. We love them both! The recipe will frost a 3 layer 8 or 9 inch cake so I think it makes 5 cups frosting. 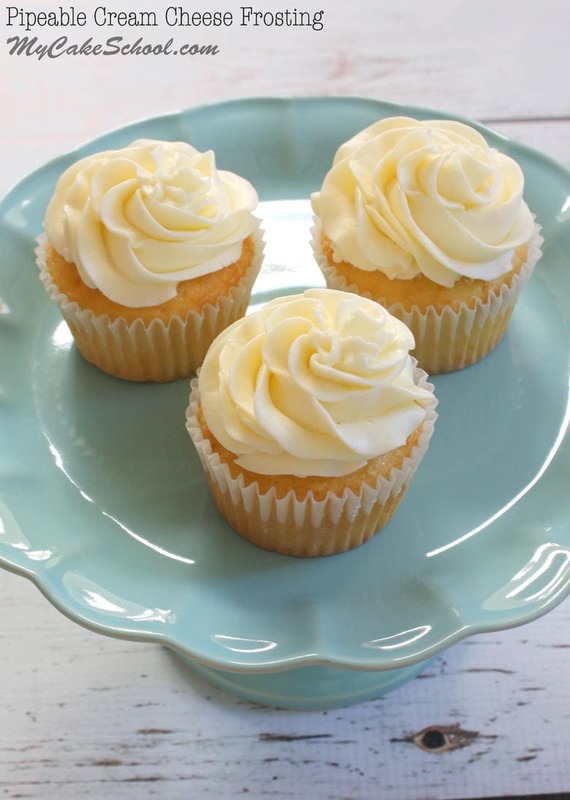 One cup frosting will frost 12 cupcakes with a simple swirl using a 2D tip. Of course, making a high swirl will need more. Delicious! Thank you so much.? It was the perfect complement to the carrot cake! My husband loved it! I noticed the picture of the cupcakes using this frosting has a yellow tint but your red velvet cake using this recipe is whiter. Did you use white gel color to brighten it up for the cake? I’m making the corresponding white chocolate trees for Christmas and I’m afraid the yellow tint will not look good. I am going to have a New Year’s Day brunch. I am baking and freezing ahead of time. I already have some red velvet cupcakes in the freezer. I’m going to make some chocolate cupcakes also. Instead of making a cream cheese icing and a chocolate buttercream icing, how can I flavor part of this recipe to be chocolate cream cheese icing? I didn’t see a recipe for that. If it’s melted chocolate or cocoa, how much? The recipe makes 5 1/2 cups frosting. Since you want half of it to be regular cream cheese and the other half chocolate, remove 1/2 of the frosting. For the remaining frosting in your mixing bowl add 1/2 cup sifted cocoa powder and mix in. You can add more cocoa powder a small amount at a time for a deeper chocolate flavor, if you need more sweetness add more powdered sugar. Hi Bebe, I can’t tell you how much I appreciate your reply!!! MWAH! I wish you had a reply button on the comments. I found that I prefer the frosting with 8 cups of powdered sugar. Otherwise, it seemed too tart. I eyeballed the amount of cocoa powder to add, because I changed the recipe. But I’d like to write down a recipe for next time. If I should add 1 cup cocoa powder to a batch having 6 1/2 cups of powdered sugar, how much cocoa should I add to a batch having 8 cups powdered sugar? For the carrot cake topping what kind of icing to put on the cake? Hi Marisa, We most often use the Cream Cheese Buttercream recipe but the Pipeable Cream Cheese recipe would be fine also.